Ian Davies looks at the SOG NW Ranger a design that bends a number of styles into a practical outdoor tool. SOG has this to say about their S24 NW Ranger: "Sportsmen, fishermen, hunters, and outdoor enthusiasts require a knife that can fulfil a variety of tasks, is easy to carry, and can perform in a wide range of environments. Withan elongated clip point blade, flat ground bevels, and compact size, the Northwest jRanger is more than up to the task." Certainly an expected comment from any manufacturer, but from a company like SOG who do make some exceptional designs I tend to sit up and take notice. The Ranger is perhaps a tad out side what I would term as the affordable quality slot at just over £80. But it's far from over priced and compares well with similar items offered by other manufacturers. So if you feel affordable/up market is for you, then this is it. First impressions are of a compromise build with no single strong theme running throughout the design, and I have to say the Ranger put me in mind of something from Cold Steel another prolific US manufacturer. This was mainly down to the one-piece, Kraton rubber handle. Weighing in at a featherweight 5.8oz the Ranger shows a 5" AUS 6 stainless steel blade. The clip point is swedged and though the tip section is well tapered, width is maintained for approximately 4/5th of the total length. In cross section the blade is flat ground with a 60/30% plain/scalloped edge. This will allow easy access cutting by the main edge with the rear teeth being able to rip through tough materials like skin, sinew, gristle and even light bones. The angle of the clip point is steep enough to lift the tip clear of internal organs when going for an edge-up cut through the belly and sternum too. The one-piece Kraton rubber handle is moulded onto the full length tang and has a rounded, waisted shape with full chequering. This surface offers a secure grip and the knife is very stable in the hand - even with blood and tissue contamination. SOG has cross slotted the rear of the spine to give you a place to put your thumb should you want to exert more pressure on the cut. The handle is reasonably long and fills even the largest hand easily and its simplistic design means good address and positioning for any grip you might choose to employ. The Ranger offers a short half guard, which gives just enough at the bottom to stop your forefinger or thumb slipping onto the edge. In edge-up stance the thumb can also push against this where more power to the cut is required. With a lanyard hole completing the 9.7" overall length, the NW Ranger comes over as a simple yet highly practical design. Like the knife itself SOG have kept the sheath simple with and a good if basic design, although I question the use of leather as opposed to more modern and practical materials. 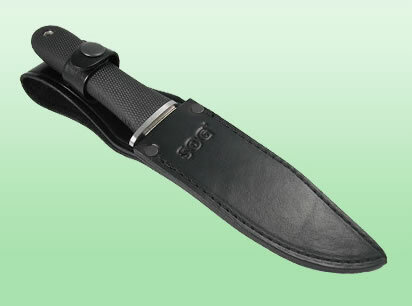 The contoured sheath holds the blade only and leaves the handle free. 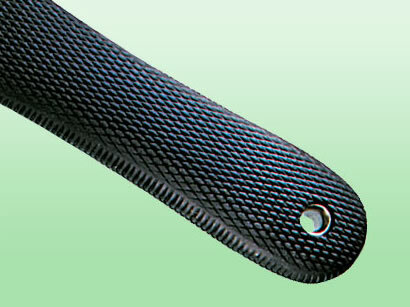 A deep and wide 4" belt loops completes the package along with a strap and press stud closure, which is secure enough. As a matter of course I'd also employ a lanyard, just to be on the safe side. Leather does look nice and if fed with the right proprietary treatments will stay supple and effective. But it cuts all too easily when the blade is drawn and put back, and to their credit SOG have riveted the top of the sheath for added security. A plastic liner would have been a good idea to stop this from happening. Also, if put away with blood on the blade, this will contaminate the inside of the sheath with no chance of getting it clean. In use the Ranger worked very well. Light, strong and handy, even with its 5" blade, the well angled tip allows good access to tight areas and the rear scalloped edge offers a good bit of extra cutting/ripping power when required. Near indestructible, this is one tough and practical field knife. You can buy the SOG NW Ranger directly from this site.